Calling all Saturday Night Live fans! 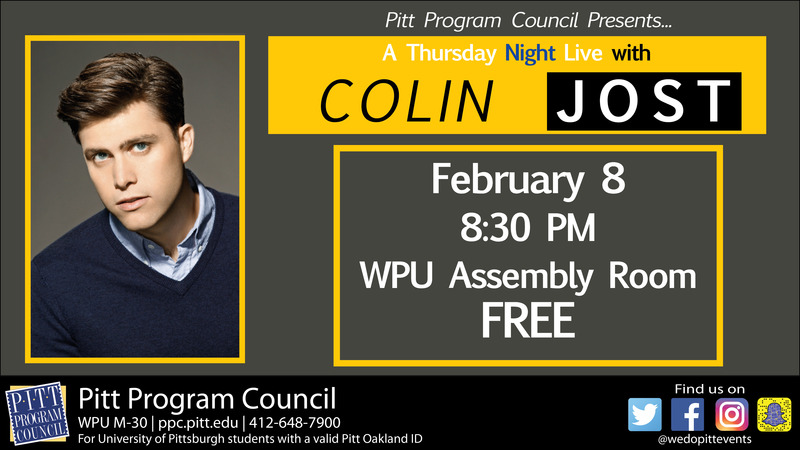 Come experience a comedic performance by your favorite SNL cast member and writer, Colin Jost! Colin Jost is the head writer of Saturday Night Live, where he’s won three Writers Guild awards, a Peabody Award, and been nominated for 9 Emmy awards. In March 2014, he took over for Seth Meyer as co-anchor of Weekend Update on Saturday Night Live. Free tickets will be available in the WPU ticket office beginning Tuesday, January 16th! Limit 2 tickets per person. All Pitt Program Council events are open to all Pitt students with a valid (Oakland) Student ID. Students with disabilities are encouraged to contact the Pitt Program Council at ppc@pitt.edu or by phone at 412-648-7900 for proper accommodations.